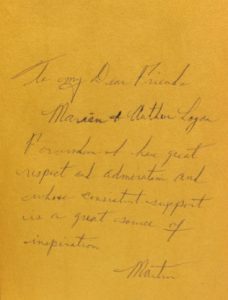 Rare books and autographs of important 20th century political, military, and civil rights leaders are a perennial favorite for collecting and gifts. This post will guide you through a selection of works by leaders from the past and present. Nonviolence is the answer to the crucial political and moral questions of our time — the need for mankind to overcome oppression and violence without resorting to violence and oppression. Martin Luther King, Jr., America’s greatest civil rights leader, had an extraordinary impact through his actions, speeches, and writings. His nonviolent protests and marches led to passage of the 1964 Civil Rights Act and the 1965 Voting Rights Act. In 1964 he was awarded the Nobel Peace Prize, and in 1986 Martin Luther King Jr. Day became a federal holiday. 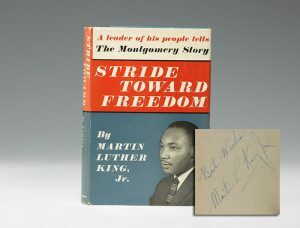 His 1958 first book, Stride Toward Freedom, was a memoir of the 13-month Montgomery, Alabama bus boycott, which began with the arrest of Rosa Parks and ended when the Supreme Court declared segregated buses unconstitutional. 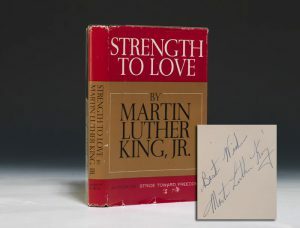 His 1963 second book, Strength to Love, was his first volume of sermons. His final book, published in 1967, the year before his assassination, was Where Do We Go From Here: Chaos or Community? I was not born with a hunger to be free. I was born free—free in every way that I could know. Anti-apartheid leader Nelson Mandela, who won the 1993 Nobel Peace Prize, became South Africa’s first black president in 1994 and published his autobiography, Long Walk to Freedom, that same year. 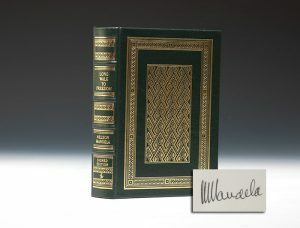 Signed limited editions, like this 2000 leather-bound edition signed by Mandela, were also issued. Do what you feel in your heart to be right—for you’ll be criticized anyway. You’ll be damned if you do, and damned if you don’t. 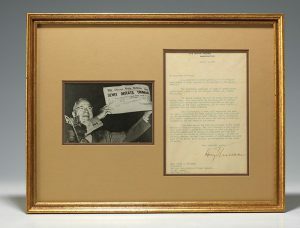 In 1945 Truman appointed her to the newly-created United Nations (the only woman among the American delegates), where she drafted the Universal Declaration of Human Rights and served as the chair of the U.N. Human Rights Commission. 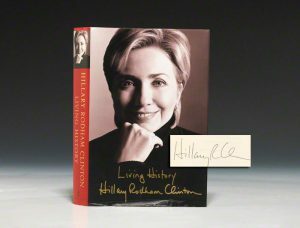 Books, letters, and photographs signed by her are very popular. 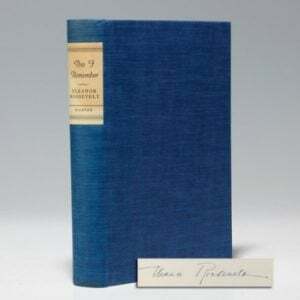 Her best-known book may be her 1949 autobiography, This I Remember. Winston S. Churchill, Britain’s inspirational Prime Minister (from 1940 to 1945, and 1951 to 1955), was not only one of the greatest leaders of the 20th century, he was also an acclaimed writer and historian who was awarded the Nobel Prize in Literature in 1953. 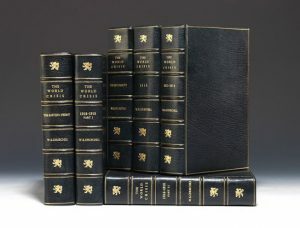 His masterpiece—part history, part memoir—was The Second World War [link: http://www.baumanrarebooks.com/rare-books/churchill-winston/second-world-war/90242.aspx], published in six volumes between 1948 and 1954. 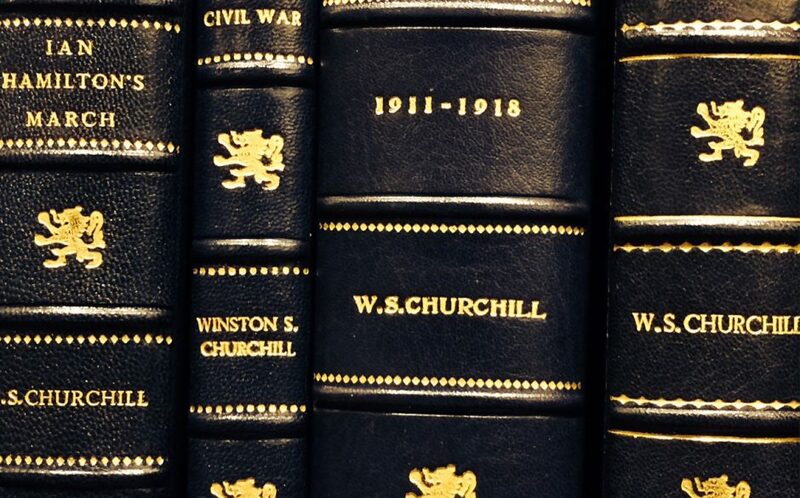 His powerful War Speeches were published in seven volumes between 1941 and 1946. We shall not flag or fail. We shall go on to the end… We shall defend our island, whatever the cost may be. We shall fight on the beaches, we shall fight on the landing-grounds, we shall fight in the fields and in the streets, we shall fight in the hills. We shall never surrender! – Winston Churchill, June 4, 1940 speech. Hear the speech. 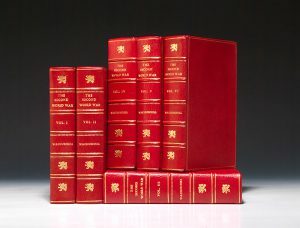 Churchill’s last great work, A History of the English-Speaking Peoples, was published between 1956 and 1958. Yesterday, Dec. 7, 1941 – a date which will live in infamy – the United States of America was suddenly and deliberately attacked by naval and air forces of the Empire of Japan. 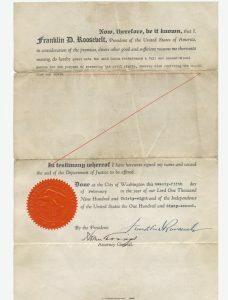 Churchill’s close friend and most important political and military partner in fighting World War II was Franklin D. Roosevelt. 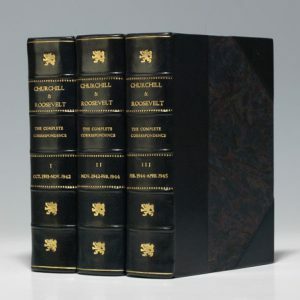 Their letters to each other during Roosevelt’s presidency, from 1933 until his death in 1945, were published in 1984 in Churchill & Roosevelt: The Complete Correspondence. 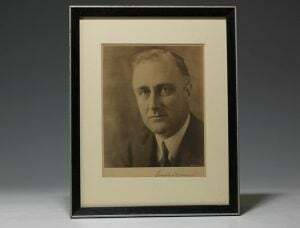 Harry S. Truman led America through the end of World War II after Roosevelt’s death. 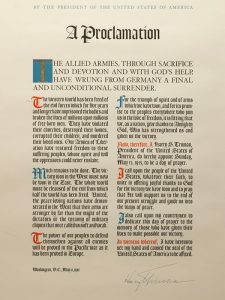 A particularly desirable piece is this large signed Truman broadside of his May 8, 1945 Proclamation on the Nazi surrender to the allied forces, praising the armed forces and designating a day of prayer. The Allied armies, through sacrifice and devotion and with God’s help, have wrung from Germany a final and unconditional surrender. The western world has been freed of the evil forces which for five years and longer have imprisoned the bodies and broken the lives of millions upon millions of free-born men…. Our Armies of Liberation have restored freedom to these suffering peoples, whose spirit and will the oppressors could never enslave. During World War II, Dwight D. Eisenhower was Supreme Commander of the Allied Forces in Europe and planned the invasion of France and Germany in 1944 and 1945. 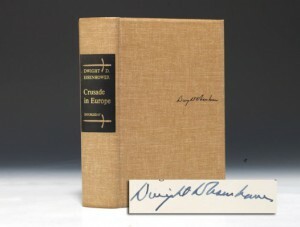 In 1948 he published his important war memoir, Crusade in Europe, and in 1952 he was elected president. A man does what he must— in spite of personal consequences, in spite of obstacles and dangers and pressures— and that is the basis of all human morality. 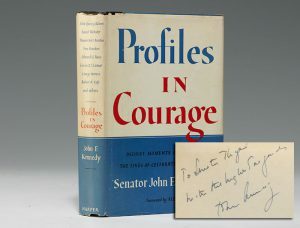 Before he was president, John F. Kennedy published his Pulitzer Prize-winning 1956 book, Profiles in Courage, in which he profiled eight senators who had shown courage under pressure. 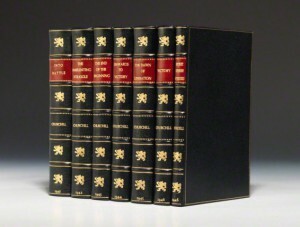 Inscribed first editions, like this copy, are extremely rare and desirable. Ronald Reagan published two notable books, his 1990 autobiography An American Life and his 1989 selected speeches, Speaking My Mind. Reagan’s most important political partner during his presidency was Margaret Thatcher, Britain’s “Iron Lady” and only female Prime Minister. 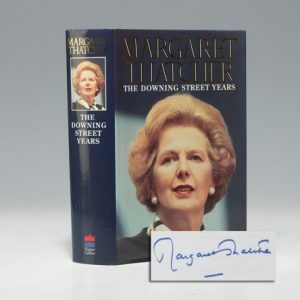 Her two key memoirs were published in 1993 and 1995, The Downing Street Years and The Path to Power. 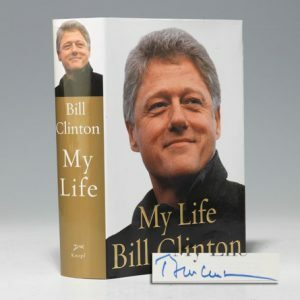 Bill and Hillary Rodham Clinton each wrote autobiographies after leaving the White House, Hillary’s 2003 Living History and Bill’s 2004 My Life. Our challenges may be new… But those values upon which our success depends – hard work and honesty, courage and fair play, tolerance and curiosity, loyalty and patriotism – these things are old. These things are true. They have been the quiet force of progress throughout our history. We’ll end with Barack Obama, who published two books before his election in 2008. His 1995 first book was the autobiographical Dreams from My Father: A Story of Race and Inheritance. 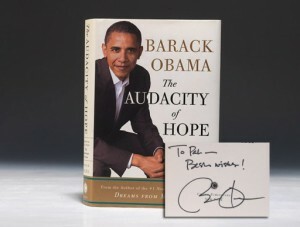 He published The Audacity of Hope: Thoughts on Reclaiming the American Dream in 2006, shortly before he began his presidential campaign. For additional ideas, browse our website, or speak with our staff by phone or in person at our galleries. 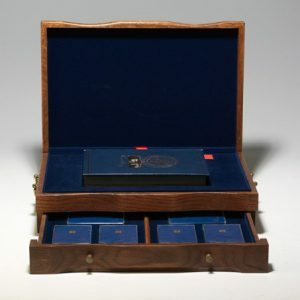 Lisa worked for Bauman Rare Books in Philadelphia from 1988 until 2000. 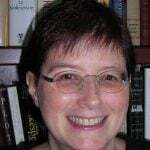 A freelance researcher in Seattle, she works with BRB, fiction and nonfiction authors, and magazines. Her interests are eclectic, but she especially likes American and British history and literature, science fiction and fantasy, and Shakespeare.